Author, fashion designer, and star of Netflix's overnight sensation Queer Eye, Tan France shares his memoir – telling the origin story of one of the few openly gay South Asian men on television. TICKET PACKAGES → Ticket Package 1: $36.40 + fees: One (1) signed hardcover copy of Naturally Tan and admission for one (1) person. → Ticket Package 2: $42.40 + fees: One (1) signed hardcover copy of Naturally Tan and admission for two (2) people. WILL-CALL opens at 6pm in the Orpheum lobby. Please check in here to be admitted into the event. PICK UP YOUR SIGNED BOOK at will-call in the Orpheum lobby beginning at 6pm. MEET-AND-GREET after the moderated presentation (for fan selfies with Mr. France). 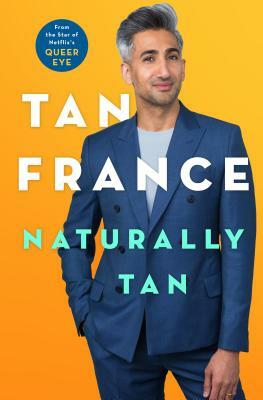 Tan France will pre-sign copies of Naturally Tan before the event. CAN'T MAKE IT? Call 602.274.0067 to order a signed copy of Naturally Tan and we'll have it signed and reserved for you. We also ship anywhere in the US and to most international locations! In this heartfelt, funny, touching memoir, Tan France tells his origin story for the first time. With his trademark wit, humor, and radical compassion, Tan reveals what it was like to grow up gay in a traditional South Asian family, as one of the few people of color in South Yorkshire, England. He illuminates his winding journey of coming of age, finding his voice (and style! ), and how he finally came out to his family at the age of 34, revealing that he was happily married to the love of his life--a Mormon cowboy from Salt Lake City. TAN FRANCE has been a successful fashion designer behind-the-scenes for over 15 years, and now steps into the spotlight as the star of Emmy-winning makeover hit, and Netflix re-boot, Queer Eye. Surrounded by an all new cast, France is the witty wardrobe wiz leading the charge in the fashion department and is ready to make America fabulous again one makeover at a time. This experience is so much more than just new clothes to the British born fashion advisor however, it's about real-life issues, changes and acceptance on all sides. The epitome of style and class, Tan is the creative mind behind successful brands including the popular ladies clothing lines Kingdom & State and Rachel Parcell, Inc. Prior to his personal success as a designer, he spent his summers working in his grandfather's denim factory while he secretly enrolled in fashion college in preparation to start a new chapter as a fabulous design star.